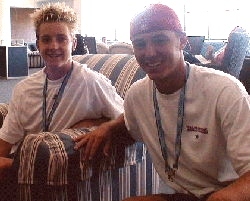 For the second time in as many years, Americans were featured in the US Open Junior Boys Doubles Championships Final. This year's team consisted of 15 year old Brendan Evans and 16 year old Brett Joelson, who had used a wildcard to make their way through. The two powerful serve and volleyers certainly made their mark on the 2001 US Open despite their final loss to the No. 7 seeds Stephane Bohli and Tomas Berdych. It was their doubles win at the Boys' 16s Super National Hard Courts that earned Brendan and Brett entries into the junior doubles at the Open. Brendan, a singles finalist at Kalamazoo, had also entered the singles and won his first round match against Florian Lemke before falling -- in a very close 7-6,4-6,6-4 -- to eventual finalist Yeu-Tzuoo Wang. Brett, on the other hand, had been forced to qualify for the boys singles and lost in that event's second round. Despite their different paths to the Open, these boys shared a definite connection on and off the doubles court. I sat down with Brendan and Brett between the doubles semifinals and finals. By that point it did not matter whether or not they were going to win, it was clear that I wanted to speak to these two talented boys that had made it this far. Q: What is it like to be in the finals of a Grand Slam? Brett: "It feels really good. This is our second time playing together." Brett: "Yes, we're undefeated and we're both first time Grand Slam players. It's a great way to start out. The teams we have beaten are good teams. Amritraj and Corkery (Stephen & K.C.) have done well in all the national 18s and the other guys (Henry Adjei Darko & Komlavi Loglo) were seeded four."